Not since about 1860 has a halau of hula dancers worn kapa garments in a public performance. 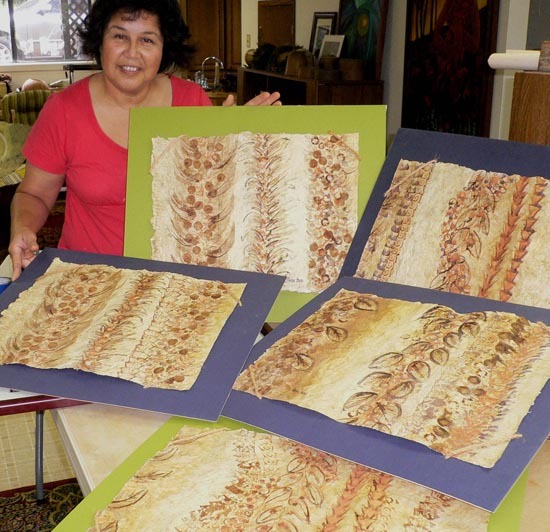 That is, until this year’s Merrie Monarch Festival, when Hilo’s Halau o Kekuhi, in collaboration with Waimea kapa masters Marie McDonald and Roen Hufford and fellow practitioners grew, pounded and printed extraordinary pieces of this indigenous fibre for a public performance that was a first in over a century. Now, Roen Hufford has contributed an exceptional five-piece series of kapa to this year’s Malaai School Garden “Art & Sol” auction benefit from 1-3:30 p.m., Sunday, June 12 at Merriman’s Restaurant. Shown here is her “Na Lei” series, each featuring rows of lei of native plants and flowers – many of the lei for which Roen and her mom are equally famous. Rare treasures and exceptional pleasures – from exquisite pieces of Hawaiian kapa by masters Marie McDonald and daughter Roen Hufford, to a delicious Hawaiian lunch paina for eight friends in Waipio Valley at the Mock Chew kalo farm; from stunning stained glass art by Calley O’Neill, Lamar Yoakum and Joe Rivera, and a valuable goddess print by the “Matisse of Japan,” artist Mayumi Oda, to a round of golf for four at the exclusive Hualalai course; and from a mozzarella cheese making class for 6-8 with Shelby Floyd, to a guided stargazing trip to the top of Mauna Kea and tour of the Canada-France-Hawaii Telescope with astronomer Dr. Christian Veillet – these and more will be on the auction block at the 4th Annual Malaai School Garden “Art & Sol” Benefit 1-3:30 p.m. Sunday, June 12 at Merriman’s Restaurant in Waimea. Malaai:The Culinary Garden of Waimea Middle School is Hawaii Island’s “model” school garden, which was first planted six years ago to grow real change for Waimea’s children and community in an outdoor living classroom. From the very beginning, Malaai was entirely funded by generous community friends and foundations as a private not-for-profit partnership with Waimea Middle Public Conversion Charter School. 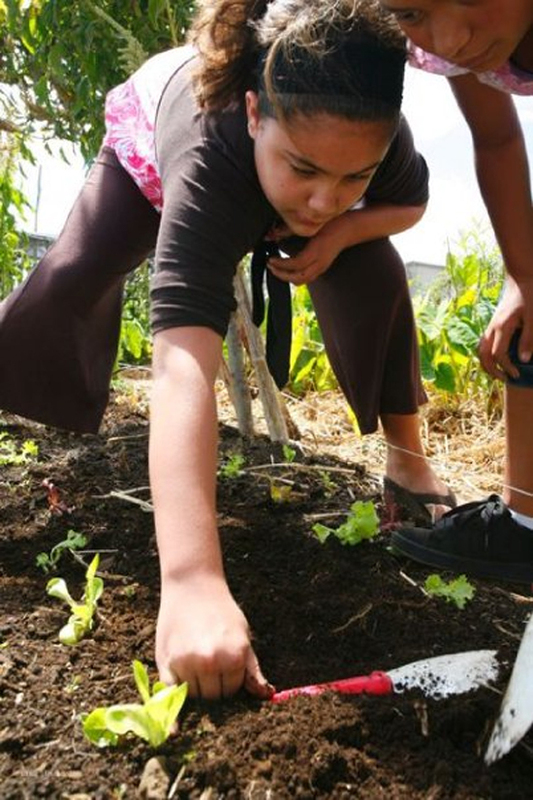 Patterned after Chef Alice Waters’ highly regarded Edible School Yard in California and led by respected educator Amanda Rieux, the program integrates nutrition education and cultural and environmental stewardship with core curriculum and hands-on learning. More than 1,600 pairs of student hands – and hundreds of community volunteers – have worked side-by-side to carve the three-quarter acre organic Malaai food and flower garden out of a former Parker Ranch kikuyu grass pasture. Students harvested more than 2,000 pounds of fresh food from Malaai during 2010 to be tasted and shared with fellow students, families and community friends. Intended initially to help address youth nutrition issues including obesity and diabetes in an age of fast food, Malaai has transformed Waimea Middle School by teaching students about where their food comes from, what the ingredients are, and why and how they are connected to each other and to their environment. Malaai also has encouraged students and families to begin to grow some of their own food in home gardens, and has helped students learn to enjoy and prepare fresh locally grown foods and to appreciate the value of paahana – hard, industrious work – when they plant, harvest and eat the fruits of their labor. 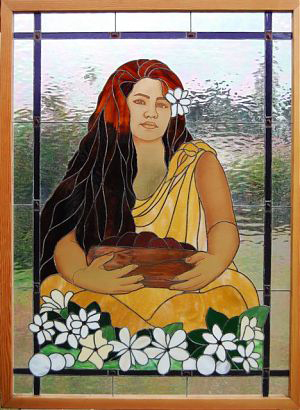 All auction items have been donated by the artist or patron to support Malaai’s mission, which has expanded to include an internship program to train school garden teachers to support Hawaii Island’s growing school garden nutrition education and food security movement that today involves more than 50 on-island schools and many more statewide. Malaai works in close partnership with the Hawaii Island School Garden Network, The Kohala Center and Hawaii Community Foundation. “Art & Sol” will include delicious Merriman’s pupu paired with vintage wines, or, for those who prefer something lighter, Malaai’s “Simply Herbs” Iced Tea. Auctioneer for the event will be Pat Batchelder of Waimea. * Traditional and contemporary kapa pieces by Waimea masters Marie McDonald and Roen Hufford. * A Hawaiian luncheon pa’ina for 8 at the Mock Chew family’s Waipio Valley kalo farm — prepared by Alberta Mock Chew. * A round of golf for 4 at the exclusive Hualalai course, plus a $100 gift certificate for dining at either the Beach House or Club Grille – total package valued at $1,500. * Two nights at Waianuhea B&B in the rainforest and clouds at the top of Ahualoa, plus gourmet dinner for two. * A two-night stay at Mauna Lani Bay Hotel & Bungalows in an ocean view room. * A framed Harry Wishard giclee of a Hawaiian waterfall. * A mozarella cheese-making class for 6-8 with Shelby Floyd. * An Indian dinner for 8 prepared by Garden Leader Amanda Rieux and Matilda Tompson. * A $500 shopping spree at Waimea Town Market, including certificates for freshly harvested Waimea produce from Kekela Farms, Kevin Cabrera’s Sandwich Isle Bread Company’s artisan breads, locally hand-crafted jams, jellies and sauces, fresh-roasted Hawaii Island coffee, locally produced sausage, plants and starts, and more. * Body work including massages, acupuncture and/or private gentle yoga by Waimea practitioners. * A necklace-earring set by Honoka’a jeweler Lucinda Moran that features a lauhala-inspired pattern with 18k gold and blue topaz accents. * A morning-long consultation by a pair of garden experts.